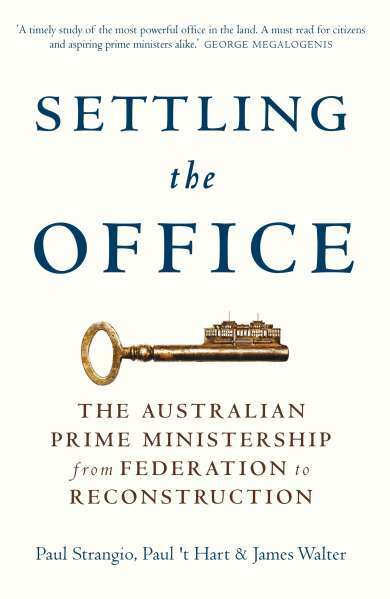 Professor James Walter considers how the office of prime minister was shaped in the first half century after Federation. One might think, given the revolving door of leadership over the past few years, that this comment is quite recent. In fact, it was a comment by one of our most fascinating prime ministers, Alfred Deakin, in 1909. Even then he was encouraging us to look past individuals and their foibles, and to think of the bigger picture, of how democracy operates - or where the prime ministership fits in the way we are governed. And once we turn to that question, it soon becomes clear that the prime ministership has evolved over time: indeed, what we take for granted now took half a century to settle. We are accustomed now to an unrelenting media focus on prime ministers as individuals and their qualities as leaders. One former incumbent, Paul Keating, argued that the quality of leaders could be judged by the skill with which they used the ‘levers’ of power to change the country. But there is all too little attention to the source of those ‘levers’ - the nature of the office prime ministers hold with the opportunities it offers and the constraints it imposes. Keating’s ‘levers’ are primarily those of Commonwealth powers and financial control in relation to the states: those powers scarcely existed before the middle of the last century. What we see today came about in decades of hard-fought institutional development. The skills and styles of successive prime ministers as they sought to gain the means to exercise national leadership were integral to this process. There was no script for early prime ministers. Experienced as many of them were in colonial politics (the first seven prime ministers had served in colonial legislatures) their context now was different. They no longer ran a government with autonomy in its own domain. The British Westminster conventions, appropriate to a unified national government, did not apply, for Australia was a federation, with a written constitution guaranteeing specific rights to the states. All of the early prime ministers found that the constitution hemmed them in and attempted to amend it through referenda. There were twenty four such attempts to enhance Commonwealth powers in the first forty-five years. Only four succeeded, and so prime ministers instead had to rely on their wits, skill in negotiation and political tactics in dealing with premiers. This proved tough at times. Nationalist prime minister, Stanley Bruce (1923-1929), finding his ambitious plans for national development thwarted, proposed a dramatic intervention in industrial relations. Without support from the premiers and facing opposition in his party, he called an early election to take his initiative to the people. He was defeated, and lost his own seat. His successor, Labor prime minister James Scullin’s efforts to manage the Great Depression were severely undermined by deep conflict over spending and loans policies with NSW Labor premier Jack Lang. Not until John Curtin’s Labor government (1941-1945) used emergency war powers in 1942 to gain control of taxation did prime ministers obtain the financial muscle to persuade states to comply with a national agenda. Until mid-century prime ministers had minimal administrative support. There was at first a personal secretary and some administrative provision from the department of External Affairs. In 1911 Andrew Fisher (Labor, 1908-09, 1910-1913 and 1914-1915) created a prime minister’s department, but it was largely limited to basic administration, protocol and correspondence. Stanley Bruce began the practice of drawing in expert advisers and establishing commissions of inquiry to supplement the limited resources available to him. Experts recruited by Bruce—such as economists LF Giblin and DB Copland—remained significant advisers to his successors. The biggest breakthrough was achieved when John Curtin and Ben Chifley (Labor PMs 1941-1949) called on experts of all stripes. They created new agencies with direct access to the prime minister, to manage the ‘total war effort’ and advise on post-war reconstruction. This made them the best supported and advised PMs of the first fifty years. It laid the foundation of the modern Australian Public Service, and of a Prime Minister’s Department that would eventually become the central co-ordinating agency it is today. Political parties at first were very different to the mass parties that Australia has had since the mid-20th century. Between 1901 and 1909 there were three parties: the Free Trade Party (from 1906 rebranded as the Anti-Socialist Party), the Protectionist Party and the Labor Party. In effect, they were fractious melanges of interest-based factions, in which the wily tactician, Alfred Deakin, leader of the Protectionist cause and a three-time prime minister during this period, called the shots. Governments typically were relatively short term, and frequently lost power on the floor of parliament rather than through elections. Deakin created alliances across party lines to promote his preferred policies, governing in his own right or at other times offering the support of his party either to Free Trade or Labor to form government on condition that certain objectives were agreed. If such objectives were not honoured, he transferred support to the other side to defeat that government in parliament. It was a system that depended above all on charisma and personal influence rather than party discipline. And it could not last. In 1909, worried by the ascendance of the collectively oriented Labor Party, the non-Labor parties finally agreed to unite against the common foe, to form what was at first called the Fusion Party, and then the Liberal Party. It was Labor, however, that then gained the upper hand, and Labor prime minister Andrew Fisher, who attended assiduously to his caucus and cabinet to establish the ‘party prime ministership’—one that derived authority not from personal influence alone but by virtue of accepting the discipline of acting on the party platform. Still, the parties were not settled. The Labor Party was always torn between radical (‘socialist’) elements, and more moderate, pragmatic activists. It would split, in 1916, over conscription for World War 1, and again in 1955 over degrees of opposition to communism. The other side was hardly less fragmented. When Labor prime minister, Billy Hughes deserted the Labor Party in 1916 because it would not support his commitment to conscription, he joined the Liberal Party, which then became the Nationalist Party, with Hughes as its leader (1917-1923). Another division between more and less radical elements in Labor during the Depression saw Joseph Lyons, briefly Labor Treasurer, leave and join the Nationalists, then retitled again as the United Australia Party (UAP), with Lyons as its leader (1931-1939). These patch-work affiliations could never boast consistency of purpose or philosophy. The emergence of the Country Party as a counter to urban dominance of policy following World War I, and the subsequent need for the anti-Labor parties to contain this insurgency within coalitions, added to the tensions. Prime ministers, on all sides, had to master such divisions if they were to survive. The battle for party unity and discipline was relentless. John Curtin’s crusade to bring the Labor Party back to a semblance of unity and respectability between 1935 and 1941 after Scullin’s defeat did much to create the Labor Party we now know. And Robert Menzies, whose searing experience as leader (and prime minister) during the fragmentation of the UAP between 1939 and 1941, led to a careful rethinking of party philosophy and organisation between 1943 and 1949, created the modern Liberal Party. These were the foundations of the more professional organizations on which later prime ministers depended. The oscillation between popularity and program seems to be a constant in the succession of prime ministers. Few could marry charisma and vision, though Alfred Deakin did. Some of those who were most intent on courting popularity we might call personalisers, because ultimately they interpreted everything in terms of their own interests rather than their cause. They rarely had a coherent program. Billy Hughes was a stand-out example—domineering, irascible, impetuously veering between pet schemes, willing to destroy the Labor Party when it would not accede to his will and near impossible to work with, but capable of generating great public support as a doughty fighter for Australia’s and the Empire’s security in wartime and then and in the diplomatic negotiations of the peace. Others were capable of generating support in less aggressive ways: Joseph Lyons (UAP PM 1932-1939) lacked administrative skill, policy finesse, firmness in decision and team building capacity, but he endeared himself to the public and kept winning elections. The popular and the personalisers were often followed by leaders committed to policy and the restoration of order. Stanley Bruce (Nationalist PM 1923-1929), for instance, succeeded Billy Hughes and at once set about setting up proper cabinet processes, measures to ensure discipline and the recruitment of experts to elaborate his vision for government. Ultimately his conviction about his cause and refusal to compromise would bring him down. But those committed to process, like Bruce introduced many of the measures needed to ensure administrative stability and institutional memory. Ultimately it was Curtin and Chifley who best learned the lessons of the first forty years. They were dedicated to their program for war management and post-war reconstruction; they understood that their first task was to carry their party with them, and then to persuade the public. To do so, they needed to cajole internal critics, and a combination of emotional intelligence and close understanding of how to use party mechanisms served them well. But they also had to calculate which battles they could win, when to stand firm and when to compromise. They needed the best possible program advice, and adept administrators to implement policy. They drew them from all quarters: this was the catalyst for the post-war public service. The ways in which prime ministers have had to adapt to the means (and the media) through which they reach their public has had a significant effect on their performance of the job. The great early prime ministers were parliamentary performers and campaigners, depending on oratory (like Deakin) or impassioned agitation (like Hughes), with their speeches printed almost verbatim in the press of their time. Word of mouth generated from public meetings was important, but print was king. Deakin, a journalist himself, knew how to achieve an effect that would ensure coverage (and moonlighted as an anonymous commentator on Australian politics in the London Morning Post, whose articles were keenly perused back in Australia). Billy Hughes was the first to appoint a press secretary, who wrote for him (sometimes in his name). Many press secretaries thereafter effectively became the political antennae of their leaders: Curtin’s Don Rodgers was a fabled example. Joseph Lyons, in the 1930s, was so effective in radio broadcasting and showcasing his ever-expanding family as part of his public persona that it generated his enduring bond with the public: he was arguably the first ‘media’ performer. John Curtin, an effective parliamentary orator and campaigner, also took readily to broadcasting. A former journalist too, he won the press gallery so successfully by inviting them into his confidence and trusting their discretion that it ensured the government’s point of view was well represented. However, none of them faced the incessant media scrutiny that became commonplace in the final decades of the 20th century. The prime ministership as an office of national influence was not really in place until the mid twentieth century. Its ‘levers’ thereafter became: the financial muscle to influence premiers; an effective and properly resourced federal public service; disciplined party organisations; command of communication channels; and an understanding that the party prime ministership, party discipline and a cabinet operating with due process were essential. It was such developments that led John Dedman to remark in a letter to his leader, Ben Chifley, in 1949, that “the office of the prime minister is becoming more and more the pivot around which the whole government machine turns”. This is not to suggest that the office did not continue to evolve thereafter. There would be significant further change in the next half century. Bureaucracy grew, ministerial advisers came onto the scene, managerialism took hold, electoral volatility increased, and the digital revolution changed political communication forever. None of this diminished the pertinence of Dedman’s 1949 estimation that the prime minister was the pivot of government. On the contrary, effective leadership, properly supported, was recognised as more important than ever. Not only the leader, but also the office itself (that is the complex of individuals and agencies surrounding the prime minister) were given unprecedented licence within the executive. But the role, potentially more powerful than ever, was also fragile: the perception of failure in any aspect of the prime-ministerial repertoire now risked becoming fatal.